The 2005 Honda CRF 80 For Sale w Motorcycle Trailer (UPDATE: no trailer..just the dirt bike) is very clean unlike most used bikes. The red paint looks good and it's in excellent condition; what more could you ask for? This CRF80 isn't like a lot of used dirt bikes for sale that you see that have been used for racing and look like a wreck! Please email for additional pics and info using the space below provided by Strike Lightning Used Honda Dirt Bikes for Sale and I will respond with answers to your questions or after consideration of your offer as soon as possible. Strike Lightning invitest you to submit a review of the 2005 Honda CRF 80 For Sale to help potential buyers make informed decisions and to benefit those shopping for the best motocross or dual-sport bike to suit their riding needs. 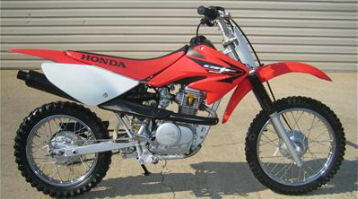 The dirt bike is located in Illinois IL and my very cheap asking price is only $1,450.00; let's make a deal!